Out on the Somerset Levels, I walked down the single track lane known as Jack’s Drove and, ahead of me, this rough track carried on southwards across Tadham Moor. In the far distance, the long line of the Polden Hills, which stood high and dry when this whole flat landscape was one of lakes and marshes. In those days, the Romans kept to the high ground: they built a road along the top of the Poldens, which led westwards to a harbour down on the coast. Click onto the image to open another version in a separate window, and click onto that image to further enlarge it – recommended. 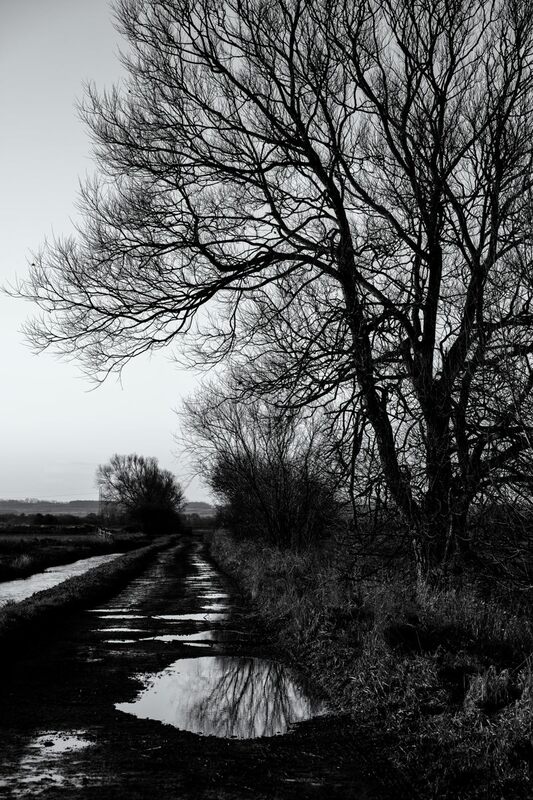 Technique: X-T2 with 55-200 Fujinon lens at 83mm (equiv); 400 ISO; Lightroom, using the Velvia/Vivid film simulation; Silver Efex Pro 2, starting at the Expressive Portrait preset and adding a light Selenium tone; Tadham Moor, on the Somerset Levels; 30 Nov 2018. Moody! amazing monochrome with depth and lovely reflection too. Beautiful shot, the B&W sets the mood. I’m glad the Levels get to you, my friend: a very simple place, with history all around. ATP xxxXXX!!! That’s a very nice image. Nice composition and use of B&W.